But this also shows how and why money came into existence. 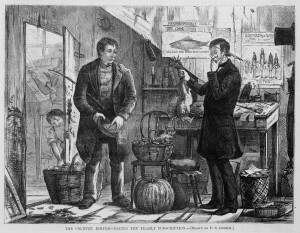 Barter used to be the only way of transacting across the world. But eventually, those who bartered enough realized that some goods were valued by many people and could therefore be traded for almost anything else. This good would then become the de-facto ‘money.’ For example, people would be willing to trade for olive oil, even if they didn’t need or want olive oil, because they knew it was very marketable and they could buy something else with it later. So how did gold become universally recognized as money? In short, it became the most highly marketable commodity with which one could barter. It also fulfilled the properties of what makes a good currency, namely it is portable (since it has a high value unlike tin or copper), fungible (since all gold metal is homogeneous), divisible (you can easily make a half ounce, whereas something like a chicken is hard to divide up), has stability of value and is durable. The ‘invention’ of money is one of the greatest discoveries of all time. But it was not one that came from the law of a government, but rather an organic process of increasing exchange and trade. It was only after this process was completed that the government entered the picture. First, it simply replaced the physical gold and used it to back paper currencies. But eventually, it removed this backing, and citizens have suffered from inflation and burdensome debts ever since. Many Greek citizens know in their hearts that something is wrong with the system when they are forced to return to bartering, fearing it “symbolizes a society moving in reverse after seven years of economic crisis.” But it is this return to bartering that could eventually make people understand what money and currency is – an easy way to calculate value and exchange goods and services. Money itself is not wealth. It is the goods and services behind it that is the true wealth. This is precisely why printing and borrowing more paper currency does not and cannot ever lead to more real wealth. Only the economic activities that the Greeks are still valiantly trying to engage in can do that – the planting of crops, the butchering of meat, the repairing of cars…..
Chris Kuiper CFA is currently a student and researcher at George Mason University, pursuing a Master’s of Economics. His previous experience includes asset management, investing and banking.